Having curtains in your home or work place are a great way of decorating the interior. Not only does it enhance the aesthetic appeal of the living or working space, it also helps to provide shade from the sun. Without a doubt, having curtains as part of your interior provides many benefits. Which is why it is important to regularly clean them to maintain their appearance. 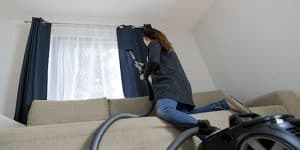 Although it may not seem like your curtains are dirty or stained, they do collect a lot of dust, which may affect your family members or colleagues who have asthma. Different curtains require different methods of curtain cleaning. Here we share a few common curtain fabrics and how to properly clean them. Polyester curtains are the more affordable options for homeowners looking to decorate their window; it is one of the more common fabric types used to make curtains. Because of its tough material, polyester curtains can be washed in the washing machine with cold water and detergent. Once the washing cycle is done, immediately dry them either by putting them in your dryer or hanging them out to dry. Cotton curtains complements modern style interior design, and they are also easy to clean. To wash them, unhook your curtains and moisten any stains with stain remover. Wash them in cold water and laundry detergent with a delicate cycle. Lace curtains can beautify any home with its delicate and eye-catching design. However, they tend to collect dust more easily than other curtain fabrics, so they should be cleaned properly. Due to its material, it is recommended for lace curtains to be hand washed with warm water, detergent, and household ammonia. Soak them in the mixture for 15 minutes, and then wash off the soap. Use towels to absorb any excess water and air-dry them. Velvet curtains border on the more luxurious side. You need to vacuum the dust from velvet curtains before proceeding to wash them. Mix a small amount of dishwashing detergent with water and pour it all into a sprayer. Spray this detergent solution on any stains, and then rub lightly. Brush the curtain dry to maintain the appearance of the fabric.